The speed, mileage, torque and all such vital parameters of an electric car solely depends on the specification of the motor and the battery pack used in the car. While using a powerful motor is no big deal, the problem lies with designing a Battery Pack that could source enough current for the motor for long time without degrading its lifespan. To cope up with the voltage and current demand EV manufacturers have to combine hundreds if not thousands of cells together to form a Battery Pack for a single car. To give an idea the Tesla model S has about 7,104 cells and the Nissan leaf has about 600 cells. This large number along with the unstable nature of Lithium cells makes it difficult to design a Battery Pack for an Electric Car. In this article let us explore how an Electric Vehicle Battery Pack is designed for an EV and what are the vital parameters associated with batteries that has to be taken care of. What is inside an Electric Vehicle Battery Pack? If you have read the Introduction to Electric vehicle article you would have answered the question by now. For people who are new let me give a quick re-cap. The below image shows the battery pack of Nissan Leaf being ripped apart to cell level from its Pack. Modern electric cars use Lithium batteries to power their cars due to some obvious reasons which we will discuss later in this article. But, these Lithium batteries have only around 3.7V per cell whereas an EV Car requires somewhere near 300V. To attain such high voltage and Ah Rating Lithium cells are combined in series and parallel combination to form modules and these modules along with some protection circuits (BMS) and cooling system are arranged in a mechanical casing collectively called as a Battery Pack as shown above. While most cars uses Lithium Batteries, we are not only limited to it. There are many types of battery chemistry available. Broadly batteries can be classified into three types. Primary Batteries: These are non-rechargeable batteries. That is it can convert chemical energy to electrical energy and not vise-versa. An example would be the Alkaline batteries (AA,AAA) use for toys and remote controls. Secondary Batteries: These are the batteries in which we are interested in for electrical vehicles. It can convert chemical energy to electrical energy to power the EV and also it can convert Electrical energy to Chemical energy again during the charging process. These batteries are commonly used in mobile phones, EV’s and most of the other portable electronics. Reserve Batteries: These are special type of batteries used in very unique application. As the name states the batteries are kept as reserve (standby) for most of its life time and hence have a very low self-discharge rate. Example would be Life vest batteries. As told earlier there are many different chemistries available for batteries. Every chemistry has its own pros and cons. But irrespective of the type of chemistry there are few things that are common for all batteries let us take a look at them without getting much into its chemistry. There are three main layers in a battery they are the Cathode, Anode and Separator. The Cathode is the positive layer of the battery and the anode is the negative layer of the battery. When a load is connected to the battery terminals, current (electrons) flow from Anode to Cathode. Similarly when a charger is connected to the battery terminals the flow of electrons is reversed, that is from Cathode to Anode as shown in the figure above. For any battery to work a chemical reaction called Oxidation-Reduction Reaction should take place. Sometimes also called as Redox Reaction. This reaction takes place between the Anode and Cathode of the battery through the electrolyte (separator). The Anode side of the battery will be willing to gain electrons and hence an Oxidation reaction will occur and the Cathode side of the battery will be willing to loose electrons and hence Reduction Reaction will occur. Because of this reaction ions are transferred from the Cathode to the Anode side of the battery through separator. As a result there will more ions accumulated in the Anode. To neutralize this Anode has to push the electrons from its side to the Cathode. But the Separator only allows flow of ions through it and blocks any electron movement from the Anode to Cathode. So the only way battery can transfer the electrons is through its outer terminals, this is why when we connect a load to the terminals of battery we get a current (electrons) flowing thought it. Since we are going to discuss on lithium batteries as they are the most preferred battery for EV lets dig in a bit more on its chemistry. There are many types in Lithium Batteries again, Lithium nickel cobalt Aluminum (NCA), Lithium-nickel manganese cobalt (NMC), Lithium-manganese Spinel (LMO), Lithium Titanate (LTO), Lithium-iron Phosphate (LFP) are the most common ones. Again each chemistry has its own characteristics which are neatly illustrate din below picture by Boston Consulting group. Out of these the Lithium nickel Cobalt Aluminum is the most used because of its low cost. We will get into more of these parameters later in this article. But one common thing you can notice here is that Lithium is present in all batteries. This is mainly because of the electron configuration of the Lithium. A neutral Lithium metal atom is shown below. It has an atomic number of three meaning three electrons will be around its nuclease and the outmost shell has only one valence electron. During reaction this valance electron is pulled out thus given us one electron and a lithium ion with two electrons forming a lithium ion. As discussed earlier, the electron will flow as current through the outer terminals of the battery and the lithium ion will flow though the electrolyte (separator) during the redox reaction. Voltage Rating: Two very common rating that you can find to be marked on a battery is its voltage rating and Ah Rating. Lead acid batteries are commonly of 12V and lithium batteries are of 3.7V. This is called the nominal voltage of a battery. This does not mean the battery will provide 3.7V across its terminals all the time. The value of voltage will vary based on the capacity of the battery. We will discuss more on this later. Ah rating or mAh rating: Next to the voltage rating another common parameter is the Ah rating. The term Ah stands for Ampere hour. Some people use mAh which is nothing but milli-Ampere hour, meaning 1Ah = 1000mAh. Ah rating of a battery tells us about the capacity of the battery. For example a 2Ah battery can give 2A for one hour, the same battery will give 1A for 2 hours and if we take 4A from it, the battery will last only 30 minutes. The above formulae does not hold true for all cases but should give you a rough idea of how long your battery will last. You cannot expect to draw 30A form a 2Ah battery and expect it to last 3.6 minutes. There are limits for maximum current that you can draw, and there will also be some losses in the process which will always reduce of runtime. Also no EV will consume a constant current, so determining how long your EV will run on this battery is not an easy task. Cut-off Voltage: The cut-off voltage is the minimum voltage of a battery below which it should not be used. Say for a lithium cell with 3.7V its cut-off voltage will be somewhere around 3.0V. This means that under no circumstances this battery should be connected to load when its voltage goes below 3.0V. The value of cut-off voltage of a battery can be found in its datasheet. If a battery is discharged below this cut-off voltage it is called as over discharging. This will damage the battery affecting its capacity and lifespan. Over discharging a battery will disturb the chemistry of a battery which might lead to smoking or fuming of batteries. Max. Charge Voltage: While cut-off voltage is the minimum voltage of a battery, Max. Charge voltage is the maximum voltage that a battery can reach. When we charge a battery its voltage gets increased, the value of voltage at which we should stop charging is called as the max. Charge voltage for a lithium cell with 3.7V nominal voltage the maximum charge voltage will be 4.2V. This value can also be found in the datasheet. If a battery is charged more than this maximum charge voltage then it is called as overcharging. Overcharging will also damage the battery permanently and might also lead to fire hazards. Open Circuit Voltage (OCV): Open circuit voltage is the value of voltage measured across the positive and negative terminal of a battery in no load condition. The OCV of a lithium battery should always be between 3.0V to 4.2V for a healthy battery. The Cut-off voltage and max. Discharge voltage is measured during the open circuit condition. Terminal Voltage: The terminal Voltage is the value of voltage measured across the battery in loaded condition. The value of OCV and Terminal voltage will not be equal, because when a load is connected and current is drawn form a battery its voltage tends to decrease based on the amount of current drawn. C-rating: This is another important rating when it comes to batteries. This rating is closely associated with the Ah rating of a battery. The C-rating of a battery helps us to know what is the maximum current that can be drawn from a battery. For example if a battery is said to be 2Ah @ 8C. Then it means that a maximum of (8*2) 16A can be drawn from the battery and it would last for 7.5 minutes. We did the calculations for this earlier. A battery will be at the maximum of its efficiency during lower C ratings. An application in which the battery size is small but current draw is very high (example drones) requires high C rating batteries. Internal Resistance: Every component has its own resistance, the capacitance has it in the name of capacitive reactance and the inductor has it in the name of inductive reactance. Similarly the battery also has some resistance in between the anode and cathode terminals internally. This resistance is called as the internal resistance, sometimes also called as Internal Impedance. Like all resistors these also contribute to losses by dissipating heat, so for an ideal system the internal resistance should be zero. In practical it is not possible to design a battery with zero IR (Internal resistance) so it should be made as low as possible. The value of IR is not fixed parameters it varies based on the capacity and age of the battery. Specific Energy: Specific energy can be considered as energy that can be obtained per unit mass (weight). 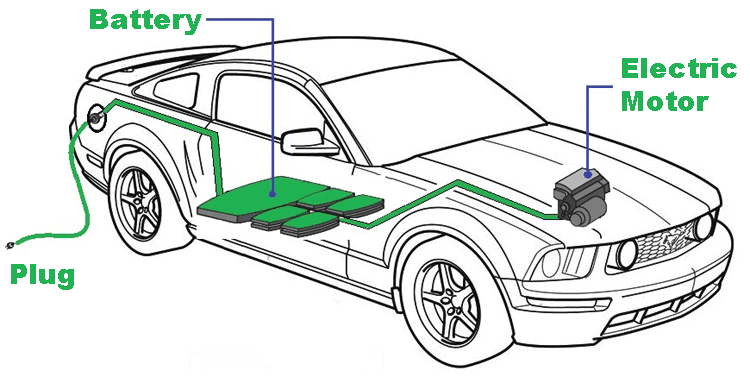 In EV weight of the battery is an important factor since the vehicle has to carry the battery along with it. So the weight of the battery should be low as possible. The specific energy of a battery tells us how much power (voltage * Current) it can provide per unit mass of the battery, so specific energy of a battery should be as high as possible. Lithium batteries have very high specific energy compared with Lead Acid. Specific Power is also the same but it also considers the time into account. It tells us how quick the energy can be obtained from the battery. Energy Density: Energy density and Specific power is a bit related. While Specific energy tells us how much energy can be obtained per unit mass of a battery, energy density tells us how much power can be obtained per unit volume of the battery. This gives us an idea of the size of the batteries since we are considering the volume of the battery. Batteries which high energy densities are the one that can deliver high power with a small package like the lithium polymer batteries used on drones. Power density is also the same but it also considers the time into account. It tells us how quick the energy can be obtained from the battery. Energy Watt hour (kWh): The Battery pack of EVs are rated in kWh (Kilo-Watt hour). This gives an idea of how long (mileage) the EV will run. It is similar to Ah rating but here we consider both voltage and current into account. For example the Tesla has 60-100 kWh battery meaning it can supply 60W power for 3 hours. Self Discharge rate: A battery losses some of its capacity even when it is ideal. This cannot be avoided due to its chemical properties but can be designed to minimize this. The rate at which the battery loses its charge even when not connected to a load is called as self discharge. There are still a lot of small terminologies that we might have missed but this sum up almost all the important terms that you should know when working with batteries. It’s time to get to the big stuff, we discussed it briefly in our previous article. Battery management system or BMS is considered to be the brain of a battery pack. It is a circuit combined with an algorithm that monitors the voltage, current and temperature of the cells in a battery pack and ensures performance and safety of the individual cells in a battery pack. It is also responsible for balance charging, SOC and SOH measurement of the cells and much other important functionality. Let us look into what they do. State of Charge or SOC is one of the most vital parameter to be measured in a battery. As we saw earlier the values from Ah of the battery cannot be used to determine how much capacity is actually left in a battery. Only if we calculate this SOC we can tell the user how much charge is left in the battery. SOC tells us how much percentage of charge is left in a battery. Imagine how hard it is to your phone when it has no information about battery percentage. Measuring the capacity of a battery is not as easy as measuring the voltage across its terminals as many people thing there are many factors which affect the capacity of a battery including charge cycles, Temperature, discharge rates etc. There are many methods in which this can be done, commonly used one is Columb counting method. We will discuss how this is done in a separate article. Depth of Discharge (DOD) is the opposite of SOC. While SOC tells us how much percentage of charge is remaining, the DOD tells us how much percentage of charge is consumed in the battery. The capacity of a battery decrease as it ages; this will reduce the range the EV could cover. Only if we keep track of the aging we can know when to change the battery. The rate at which an EV ages also depends on the operating temperature the C-rate under which the battery is operated, charge cycles etc. State of health measures the health of the battery in percentage by considering its aging factor. The further it ages the lower will be health of the battery. Cell balancing is another important task carried out by the BMS, as we know multiple cells will be combined in series or parallel to form a battery pack. The cell voltage of all the cells should always be equal, for example in a pack of four 18650 cells connected in series the voltage across all the cells should be same else cell with lower voltage will be over discharged and the cell with higher voltage will be over charged. To prevent this BMS performs something called Cell balancing, it detects the cells with higher voltages and discharges them till the potential matches with its neighbors. Apart from this the BMS also ensures environmental and electrical protection of the cell. It monitors the temperature of the cells and controls the cooling system present in the BMS. The Tesla model S has a liquid cooling system (Glycol) inside the Battery Pack which is controlled by the BMS. The coolant not only cools the battery but also heats it up to nominal temperature if required during the winters. With this we have reached the end of the article but defiantly not the end with what can be learned about EV batteries. So if you wanna be an expert this is where you just get started. There is so much more to learn like battery Modeling, BMS design Battery Testing protocols etc. but let’s have all these for a different article. I believe this information was useful and has sparked the interest in you to know more about EV batteries and how it works. Let me know your thoughts in the comment section and let’s meet in another interesting article on Electric vehicle.